2018 Reviews of brewpubs, craft breweries and beer festivals. "All Breweries Is Local"
2018 All Breweries is local! The above statement was originally political: "All politics is local" meaning that what one did for the local area is what mattered most. Today it might not be as true as years ago but in brewing local still matters. The trend of small local breweries continues unabated. These smaller craft breweries have been popping up everywhere. Florida now has over 200 breweries and more open each month. (As of 2016, the latest figures form the Brewers Association.) These breweries provide locals with jobs and patrons with fresh locally produced beer. This model will continue to work for brewers / owners of they remember to take care of the customer and offer a good fun experience in their taprooms. I have watched this growth in south Florida; witnessing our own version of beer history. Places that opened in 2012 are now 5 years old and established. Some have grown more than others. No one ever knows just how the business will evolve so there is some trial and error out there. I say keep making great beer and people will come. Add a cool taproom where they can see the brewing process and relax and enjoy and it will work. A major lesson I have seen is to be inclusive and cater to all groups. A chain of beer themed venues all closed because they only catered to a certain younger demographic. (Millennials) They forgot other people might not want ridiculous blasting music all the time in the sports themed bars. (Some of these folks might have more time and disposable income to spend than the target group.) It's a fine line but most brewery taprooms figure it out. It's been fun watching the craft beer scene here grow up. I also travel and see this everywhere. My beer blast Archives have lots of local history. I was updating them om my website and enjoyed knowing what happened to a place that was new when writing about it. The review pages provide the same insights. 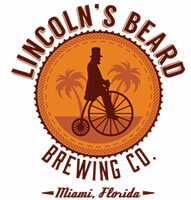 A craft beer bar opened in Fort Lauderdale in 2012 and now has 4 locations throughout south Florida. (Tap 42) Several breweries have grown into regional brands with great success. (Funky Buddha / Cigar City) The majority remained local, serving locals and visitors with good beer and good times. 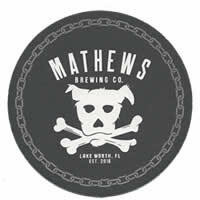 Mathews Brewing is located in Lake Worth's Artisanal district on the south side of town. The area is a mix as there are auto repair shops across the street and art galleries down the street. Parking is easy; they have neighbors that allow parking in their lots after dark and a dedicated lot just down the street. They have been open for just more-than a month; I tried the beer at the Jupiter brewfest (see below) and I wanted to visit on my way home. Entering the facility you have a complete view of the 10 bbl brewhouse, other brewing tanks, bar and taproom. There is an outside beer garden area where food trucks are available and music will be offered in the future. The brewing team is making some great brews and there are 14 available at any given time. On the wall there is a big menu board with most of the beers they make. Not all are available; there is a beer menu handout for what is on tap. A special feature of Mathews is that they have a cask beer brewing program. There are very few breweries in Florida making cask ales. The Accelerate American IPA is a really tasty one; not overly hoppy with hints of the malts in the background. A very quaffable IPA. The Heavy Metal Double IPA is drier and served in goblet style glasses. There are other IPA's that all sound good but not on tap this day. The White Goblin was a refreshing authentic Belgian witbier and the Rif Raf Porter was good as well. There are many more beers here and I would like to try more on another visit. i was with a group and everyone enjoyed the beers that had. Food was available and the cold water dispenser by the entrance is a nice touch. I recommend Mathews to anyone in the area of Lake Worth; you won't be disappointed. It would be nice to be closer to these guys; the beer recipes are looking good, are authentic and true to style. The brewery had a team of 3 that handle the brewing duties, it looks like they work well together. Looking forward to my next visit. See mathewsbrewingcompany.com for more information. The tenth annual Field of Beers was held Friday January 27th. The event is in Roger Dean Stadium along the baselines and in the dugouts. It is limited to 375 people and has 15 stations where a beer is paired with a special food selection. The event is one of south Florida's best with beer enthusiasts and industry people enjoying the food and beer pairings. It was a beautiful late January night; cool and clear. This festival had been blessed in it's 10 years, to never have weather affect the event. As I entered the right field Swamp Head Brewing had Space Gator a quite tasty New England IPA. They really have managed to pack hoppy tastes into this "Hop Sada" This was paired with Tigers Tears a Cambodian salad mix that was quite spicy. The legend says that this could make a tiger cry! Other memorable parings: Fresh Blue Point oysters on the half shell with smoked driftwood mignonette paired with Victory Wisdom's Hour Barrel - Aged Sour Ale. This was a new idea; the fresh oysters were great. The sour ale was a surprise pairing that worked well. Twisted Trunk New England IPA went well with Split Roasted Taco al Pasto: coal roasted pork with pineapple and local hot sauce "Rincon Heat". This hot sauce is one of my favorites every year. Copperpoint Brewing's "Coxeness Monster" Imperial Stout was paired with Peking Duck Bratwurst inside a scallion pancake was in the right field dugout. Dessert was cider dipped honey mini doughnuts rolling fresh and hot out at second base. The FOB is still one of the best events in south Florida. A few vendors ran out early; they can bring more next year. See you there. The festival was on Saturday afternoon. This was the 12th annual and the organizers really have everything down. After entering the stadium there is a wide variety of food available. The festival area is set up with tents around the perimeter and a few in the center. A map of breweries is provided so you can find one you are looking for. Continuing with the local theme there were more local and Florida breweries this year. My idea was to try mostly new breweries that I haven't had before. Also look for special brews from all breweries. Upon entering, the first few breweries on the left had long lines so I moved forward to some that weren't as busy. I found Ookapow Brewing a nano brewery from West Palm Beach. I had a good Rye IPA and the rye malts stood out. They also had Coffee Porter and a Tripel. Nearby was Hop Life Brewing from St Lucie West. Calypso Bay Double IPA was my choice and a good one. As the festival goes on it is good to go to different areas; avoiding busy places until they let up later. Barrel of Monks of Boca was next door. They are making some of the best Belgian style brews anywhere. Tampa Bay Brewing was nearby; the Elephant Foot IPA is their beer that is distributed around the state. Swamp Head Brewery of Gainesville had Big Nose IPA and a blueberry wheat. I have known this brewery since it started and was surprised to find out that they are 10 years old and now available statewide. I can't list them all but I did stick to my idea of Florida breweries almost the entire afternoon. One exception was Sierra Nevada Brewing which now has a second brewery in western NC. The beer market has become challenging for the larger brewers but SNB is meeting the challenges. The Hazy little thing called IPA is their NE IPA and was excellent as expected. Other Florida breweries include: Cycle (St Pete), Due South (Boynton Beach), Bold City (Jax), Aardwolf (Also Jax), 26 Degrees and Saltwater. The list is growing to the point that everywhere you visit in Florida there is at least one brewery somewhere nearby. The Jupiter festival is still one of the better run, good vendors and the crowd is local and all having fun. For me is it s good weekend of beer out of town and always finding new brews to try. In mid April I visited Cleveland for the Rock and Roll Hall of Fame induction ceremony. Accompanied by my friend Jim, it was a weekend of great beer and music. We arrived on a Thursday and headed right downtown for lunch and beers at Masthead Brewing Co. It was a nice day outside and we parked behind the brewery. In the parking lot we saw big cans of spent grain that probably will go to a local farmer for animal feed. Located in the historic Bryant Building, originally an auto dealership Masthead found the perfect home for their operations. Upon entering, the high ceilinged room with an open layout makes every aspect of the operation visible. Brewing, canning and cooking are all open to the room. A long bar and many tables complete the room We sat at the bar and ordered some tasters and a flight. All the brews were excellent. My flight had Midwest Red IPA a balanced brew with some fruity tastes and good maltiness as well. The Brute Force Double IPA was a very hoppy brew that hid the alcohol level (8.7%) well. The Unbound Principles Belgian Quad was tasty and true to the style. The Hazean Saison was a nice surprise; light and slightly hazy and at 7.8% it might be the highest ABV I have seen in a saison. The BBA Hazelnut imperial stout was quite tasty; aged in bourbon barrels with vanilla beans, cocao nibs, coffee and hazelnuts. These blended together well; one of the better Imperial stouts I have had. The award winning red IPA was my favorite and I had a pint with my lunch; a beer boiled brat sandwich. This is a great place and is huge; it looks like they gets busy on weekends or game nights. 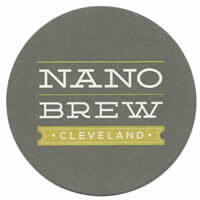 It is near everything downtown and should be on the list when visiting Cleveland. A great start to the weekend. Website: MastheadBrewingCo.com The site is informative but don't expect the all of beers listed there to be on as the site isn't kept up to date. No matter; whatever is on will be good. There are more pictures of my visit on the GBL FB page. Forest City Brewery is located just north of the Ohio City breweries above. The building dates to the early 1900's and most everything there is reclaimed or reused from another era. The first thing a visitor would notice is the old time cooler behind the bar. It looks like it was an "icebox" back in the day. There is old time breweriana throughout the place. It was late when I visited so we didn't get to try everything but the beers tried were good. Atlantic Beer Garden, named after the place on this property from 1865 to 1915, was an English pale ale made with Ed Dorado hops. This is a newer hop variety that I have noticed at other local breweries. It gives the beer a good fruity taste and aroma. The Opening Day IPA is a balanced IPA brewed with Mosaic and Citra hops giving fruity notes and bitter aftertaste. This was my favorite; I wish I had more time to try some of the others. Dark beer lovers would really like FCB as several were available. I met the owner who was welcoming and pointed out some of the classic brewery signs he had up. It was a good visit to what I would call a neighborhood micro brewery similar to many I remember from the 1990's. Proudly serving the neighborhood folks and visitors; not trying to make beer for the entire state or region. This makes it different from others; friendly and brewing some good beer for us. As spring comes the outdoor beer garden will open and things will really start to warm up. Website: ForestCityBrewery.com More pictures on the GBL FB Page. 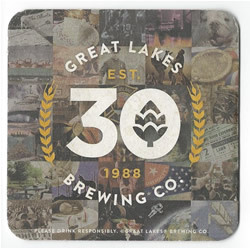 Great Lakes Brewery Company is celebrating their 30th year of brewing this year. They have come a long way in that 30 years. I first visited in 2008 and enjoyed the beer and food. This year was great and there were a few new beers as well. The brewpub is located in the original brewery and still brews pub exclusive brews on the old syatem. The new and larger brewery is just down the street. The picture to the lower left is the brewpub bar and underneath it is the brewery. (Rollover the inage.) I had a Commador Perry IPA, a hoppy ale with a good maltiness. The IPA is one of the original beers from GLBC and remains good the this day. The Barleywine was pub exclusive and quite tasty and a good example of the style. Served in a snifter glass it went will with the cheese board from the happy hour menu. We wanted to go to an Indians baseball game and our beer tender let us know about the shuttle from the brewery to the ballpark. This is a great service; park nearby, enjoy a fresh beer and get a ride to the game. The shuttle runs all night; if you want to leave early just call and they will come get you. The Friday night game was the only game of the weekend to be played. It was almost a full house and there are all local brews available throughout the stadium. After the game I returned to GLBC and enjoyed a nightcap with several fans. Cleveland is a friendly, fun town and the locals reflect that. GLBC is a local / regional brewery with a rich local history. The brewpubs Tiger Mahogany bar is cool old piece where Elliott Ness drank. 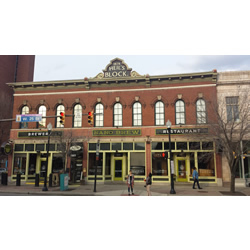 There are many more historical facts about the building and other GLBC buildings as well. See the GLBC website for more. There are several breweries within walking distance. The Ohio City area must have 12 or more. GLBC started it all and there must be room for everybody as most places were busy. I attended the Rock and Roll Hall of Fame induction and went to a party afterwards. This was a "pop up" in a hotel lobby. I went to the bar and saw only big 3 beers. Just then a case of GLBC "Dort", a local favorite appeared. This saved the evening and I got to try the Dortmunder Gold Lager. I don't drink many lagers but this was a good one. The "Dort" is GLBC's best seller and I can see why. Light and easy drinking with malts and light hops tastes throughout. I am glad I got to finally try it. GLBC has expanded production and is now available in many markets. This is good to see but there still is nothing like getting it fresh at the brewery in Cleveland. If there ever was a Florida style brewery, Mad Beach is it. The location is so Florida; near the gulf with lots of places for tourists and locals alike. The St Johns inlet / pass is just south of the brewery and there is something for everyone. Mainly a great day at the beach. Coming in to Mad Beach I was amazed at the size. They could serve a couple hundred people at anytime! The place reminds me of the bier gardens / food halls that are popular in Europe. The group ordered several flights of beers to try everything. In addition to craft beer, MBB also makes mead (honey wine), ciders and sangria. My flight had six brews. Amber Ale, Madeira Vice IPA, Hop Box a hoppy plae ale, Pirate's Booty, (Orange Blossom Mead) Oaky Doohcay and Oscuro an Imperial Brown Ale. My favorite was the amber ale which had a good malty taste. The IPA was bitter and good tasting. The imperial brown was good (and strong at 9%ABV) the style isn't common; this one was good. The mead was OK but I think they should stick to beer. The other flight had several of the ciders and sangrias. The overall response was that all these were "too sweet". I sipped a few and agree. I like my beer and leave the sweet stuff for others to enjoy. The menu looks good; we had just come from lunch and didn't order food. The "Gulp Coast" craft brewery passport is a Tampa - St Pete area booklet with over 50 breweries listed. 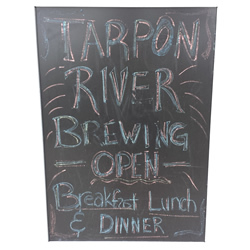 MBB is one of them and I now have the passport and need to visit the rest of the breweries from Tarpon Springs to Sarasota!. It's a rough job but someone has to do it!. I enloyed my visit and left to head to North Carolina for the next month. The website is madbeachbrewing.com; the core tap list in there; seasonals are listed at the brewery.I also have a few photos on the GBL FB page. Situated in the small rural town of Marshall, NC,. about 20 miles north of Asheville, MadCo Brew House has brought small batch craft and a cool gathering place to the area. Driving into Marshall, you are taken back in time. The town looks like it did many years ago and has buildings and signage from an earlier era. Gulf, American Motors, Phillips 66 with a Star diner. In front of the diner sits a 50's De Soto car. Most of the buildings look as they always have but are still in use; housing natural food stores, various professional services, a bank and fire department. Next to the fire department is MadCo Brew House. The building was converted for the brewery and taproom keeping it like the rest of Marshall. The front patio has an old Dr Pepper mural that has been there for years. Inside the high ceilinged tap room has bar and seating with the brew area at the back. Climb the stairs on the left to the rear outdoor patio with a great view of the French Broad river right there. Between the patio and river is a railroad line which is only feet away from the building. I was there about 2:00 and J'aime was behind the bar. Out of New York he was right at home here and was friendly with everyone. He got me samples of the house beers. The small batch brew equipment allows for some experimentation and different beers. There were several unusual styles ; Grisette made with Idaho 7 and Comet hops, and a dry hopped farmhouse ale using Simcoe and Comet hops. A Porter, Wheat ale, apricot Hefe and Southern Grit round out the house beers. There are also 10 guest beers available. The farmhouse was the best; refreshing and the hops made it tasty. I had a pint of Farmhouse along with the house specialty bratwurst. The brat was great; well worth the wait and went well with my beer. I looked around and was on the back patio when a train rolled by. This back area could be the best available when it is a bit cooler. Imagine a fall day with all the leaves in colors and sipping a good beer and taking in the view. MadCo is a great local place and well worth leaving the city for a while for a nice laid back day. i have a few pictures on the GBL FB page and MadCo's website is HERE. Peaks and Creeks Brewing Company is the fourth brewery to open in Brevard, NC. It is amazing that a town of this size can have this many breweries, but these days many small local breweries are popping up everywhere. As long as they have a good and loyal local following these breweries should thrive. Peaks and Creeks looks like they are on the way to success. Located in the old lumberyard facility in the "lumberyard arts district" many people have already found them. I was there on the fourth 'official' day of business and there were already "regulars" there. If I were local, I would be there regularly myself. It was hard to find as there is very little signage. Once I found it I went to the taproom for a sampler flight. There were ten different beers and Jon the brewer and owner was helping at the bar. My sampler was IPA and Amber ales. Both had a regular version and a imperial (stronger) version. The IPA's were both good but the amber stands out. Chunky Gal, named after a mountain in far western NC., is a great malty amber ale. This is how an amber / red ale is supposed to be. The red style was created in California in the 1990's. it was based on the English Amber style but made bigger and better as Americans have done with many other styles as well. The Super Chunk was ever better. I got a crowler to go. Jon told me that he was the brewer / co-owner at Tipping Point Brewing in Waynesville. 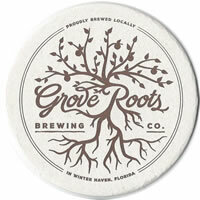 The partnership broke up and Jon brought the brewing equipment and his brewing skills to Brevard. I enjoyed my visit and met many people on the Friday evening I was there. As Brevard folks usually are, they were friendly and enjoying their newest local brewery. There are some pictures on the GBL FB page. Website is HERE. Update March 2019: Peaks and Creeks closed on Nov. 15, 2018. Brewer Jon had health issues and the financial strain was also an issue. Upcounrty Brewing has opened a second location here and the beer list looks great! 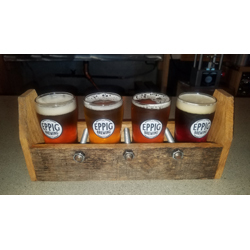 Fire Forge Crafted Brewing had their grand opening June, 28, 2018. I was visiting friends in town so it was good timing. My friends had heard the ads on the radio mentioning that the new brewery would open at 5:00 in downtown Greenville. We arrived just after 5 and it was a quiet start. By 6:30 there was a line to get in. The brewery is located just across from the county courthouse where many new customers will come from, I'm sure. We were greeted by a fitrendly and outgoing staff and ordered samplers at the bar and got a table. FFCB was the last brewery we visited and the most enjoyed. My sampler had four beers and the Spinto Santo IPA was voted the best at our table. Other beers were Sunshine of Your Love Cream Ale which was a nice smooth version of the style. Fires of Helles was a Helles Bock, a style I don't see to much. It was light with some hoppiness n the background. The Summer Solstice was a Saison brewed using local ingredients. The word was out and the crowd was starting to expand. Where we were able to walk up and order was now a line with ten people. I met Nicole who is part owner along with her husband the brewer. She asked how we found out about the new brewery and wondered what we thought. I appreciated the personal touch on such a busy day. This was good in several ways; she meets some of the new customers and gets feedback on how the ads etc. worked. There is plenty of outside seating at tables crafted from old wire reals and regular picnic tables. Inside has several different areas; the bar, short tables near the bar and an area that looks like a living room at your house. Very cool decor with deer antlers and lamps just like home. The taps are each unique using old tools and bones for the handles. I have some pictures on the GBL FB page and the taps are there. FFCB is off to a great start and I look forward to returning this fall to see how things are going. Also to try some new beers as they plan to make many special brews in the future. Overall a great first day. Website:fireforegbeer.com View more photos on the GBL FB page. Coronado Brewing - Coronado, Calif.
Coronado Brewing has been one of my favorites since I tried several of their beers in Florida. Those beers, especially Idiot IPA, were enjoyed while I could get them. Unfortunately, Coronado is no longer in Florida. So, a chance to try some of their brews fresh from the brewery was not to be missed. I visited San Diego for a few days and found that there are 153 breweries in the metro area. This is incredible as the area population is similar to south Florida and there are less than 60 here. We have work to do! I took the ferry to Coronado with a local friend who said it would be a good way to get there. This proved to be a great idea. The ride over and back allowed me to see the city around the harbor, local landmarks, as well as Navy ships and many other vessels. After lunch at the Coronado Hotel, a classic old hotel that has hosted presidents and celebrities for years, it was time to get to Coronado Brewing. The Coronado location is a brewpub with a varied menu and over 20 fresh beers on tap. The place has a laid back "island" atmosphere and was busy this mid afternoon. IPA's are big everywhere on the west coast and Coronado didn't disappoint. My sampler of 5 beers were all IPA's!. 22nd anniversary IPA was a double with massive tropical fruits flavors and aromas. It was an easy drinking 8.5% ABV; the alcohol was not evident. (True of all of Coronado's stronger ales.) 92118 XPA is a "session" pale ale brewed for 92118 day on 9/21/18. (Does it only happen once?) A good lighter pale ale that had some malts going and citrus hops with a dry finish. Hello Summer was another double IPA not as bitter as the 22 anniv. ; the slight sweetness of the malts helped balance out the bitterness. Island Hopper is the classic West coast IPA with piney tastes and aromas very hoppy and a nice bitter finish. Tiki Sunset IPA was brewed with experimental hops that gave it tropical tastes of coconut and tangerine Rye malts were added to make it sweeter but the tropical tastes were dominant. I was able to talk with some of the brewers who were working in the brewing area right behind the bar. They are brewing some great beers here and I will return one day. The ship was calling and we made the short walk over and headed back to town. A great start to my 3 week trip along the west coast. 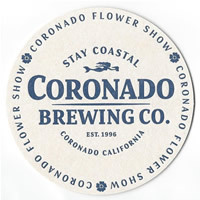 Many more breweries were tried but Coronado stands out. Website: Coronado More pictures on the GBL FB page. Culture Brewing has been open since 2013. The original brewery and taproom is in Solana Beach with two smaller satellite tasting rooms further north. I was able to visit the Encinitas taproom and the original location while in the San Diego area. The vibe is a laid back feel featuring local artists creations and an industrial style of design. I went to the Encinitas tasting room an a Friday night where they had a good crowd and the surrounding area was busy. The tasting room was like an art gallery with a small bar attached. Great selection and beer for the small space. I had a Mosaic IPA which was a tasty California IPA with citrus tastes and not too bitter. This would be my go to beer at both locations as I wanted to enjoy IPAs while in San Diego. It wasn't a long stay but I could see that the beers were enjoyed by all, living up to Culture's motto: "Classic styles done beautifully". A good visit, I could see that the downtown Encinitas area is fun on a Friday night. The following day, I visited the brewery in Solana Beach. My local friend's son was playing in the early band at the taproom. We arrived as they were setting up. The band was set up right in front of the fermenting tanks, open to the outside. It was unusually warm that day and I saw that the equipment was basically outside. Apparently, it rarely gets this hot so brewing / processing beer can be done at room temperature around San Diego. The five piece band played well featuring flute for a few songs. The overall laid back SoCal vibe and local artists in abundance really made the evening. The Mosaic IPA still was great and my visit was over too quickly. Special thanks to Rick who showed me both Cultures and gave me the local feel of the area. Website: Culture.com I wish that they had even half of the beers listed on the site available! A few pictures are on the GBL FB page. Rip Current Brewing - San Marcos, CA. Rip Current Brewing is a classic San Diego brewery. 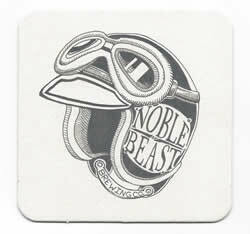 Founded by two avid homebrewers who have brewed almost every style imaginable. They have some really great recipes reflecting all those years of experience. I visited the original brewery along the Hops Highway in San Marcos, CA. RCB has been around since 2012 and the place reflects the local passions. Surfing, laid back atmosphere and good beer. The menu of around 15 to 20 brews has a good variety of styles and everything I tried was excellent. Being in San Diego there were 3 IPAs (of course!) and a nice selection of other styles. I love IPAs but really like to see variety in selection especially in a smaller brewery like RCB. They had several dark brews; a dopplebock, 2 porters and a stout. Lighter beers were also represented as well as some Belgians. I ordered a flight of five which comes on a 'surfboard' holder, a cool idea for the area. It is pictured to the left. My tasters were 3 IPAs, dopplebock and a Belgian Tripel. Of the 3 IPAs Lupulin Lust Double IPA was, by far,my favorite. It was citursy with a piney aroma. Off the Lip IPA and Foggy Nelson IPA both were good; each using different hop combinations. The surprise of the day was the Delaminator Dopplebock. There aren't many dopplebock at craft breweries but this one is a winner. It's a lager and the slight sweetness was unexpected and welcome. The German style can be found in bottles from Germany but this fresh American, San Diego brewed example might show how some of the 6 month to a year old imported beers tasted when fresh on draft. Good job here; I would like to have time to sit and enjoy a pint to really appreciate this brew. The Take Off Tripel had a nice fruit taste followed by a slight spiciness. For more about the brewers and the brews see ripcurrent.com. Some pictures are on the GBL FB page. Stone Brewing - Escondido, CA. Saint Archer Brewing Co. - Encinitas, CA. Karl Strauss' Brewery - LA and San Diego CA. Optimism Brewing - Seattle, WA. Everybody's Brewing - White Salmon, WA. Double Mountain Brewery & Taproom- Hood River, OR. Big Horse Brew Pub - Hood River, OR. Mt. Hood Brewing - Government Camp, OR. Deschutes Brewing - Portland OR. Public House. The Road to Portland (US 25) leaves the beauty of the Mt. Hood area behind quickly. Before long you are going through small towns and losing elevation. We headed right to downtown and found Deschutes Public House easily. It is a very cool atmosphere there, decorated in "northwest style" with many wooden carvings all around. For a Sunday evening it was almost full, testament to the great beer and culinary 'art' of creating pub food at a high level. There is a large brewing area, behind the bar area, that produces experimental and seasonal brews for this location only. The core beers are from the main brewery in Bend. The Elk burger was made from Durham Ranch (Wyo.) meats and the beer was Oregon made, of course. Mountain Skyline IIPA was excellent with a good malt sweetness, resinous with citrus and other sweet aromas. What a great visit; I am ready to go back now! Next time several days must be spent in one of the best beer towns anywhere. Website: DeschuresBrewery.com A few pictures of this cool pub are on my GBL FB page. Roseburg Station Pub & Brewing - Roseburg, OR. Part of the McMenamins chain of pubs around the Pacific NW, this location is housed in an old Railroad depot. The trains still run but no longer stop in Roseburg. After a tiring day, the dark and quiet pub was welcome. We were lucky to find an open brewery; Roseburg has several but they all are closed on Monday. The building has been restored to it's original grandeur and the pub is a good fit. Habitat for Hoppiness 2x IPA was a citrusy tropical brew made with 4 types of hops and 2 malts.. At 8% ABV and 63 IBU it pleased this hop lover. The food is good; the smoked turkey dip and soup made a good light late dinner. Website. Wild River Brewing - Grant's Pass, OR. Rogue Ales - Newport, OR. 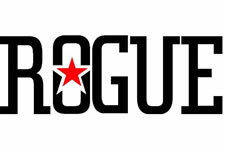 Rogue has been brewing great beers since 1988. The World Headquarters in Newport has grown into a major beer brewery along with a distillery. I have enjoyed these fine ales since the 1990's and have never had a bad Rogue! Brewer John Maier has been with Rogue since 1989. This has provided a consistent quality and a huge following - Rogue Nation. I visited Brewer's on the Bay brewpub inside the world headquarters. It has a view of Yaquina Bay and the marina below. There are 40 Rogue ales and lagers on tap along with an eclectic pub menu. It's a cool place and is a 'real' pub with various Rogue memorabilia all around. It definitely has the 'lived in' look. No ferns, Formica surfaces or pretension here. Just great beer and pub fare. My sampler of 4 brews was all IPA: 6 Hop, 7 Hop, 8 Hop and 10 Hop. All were great but the 8 Hop was the best. 6 and 7 are definitely good Rogues, the 10 is simply too strong for me so the 8 was the winner. The buffalo chicken sliders were spicy; perfect for the IPA sampler. My friends enjoyed several of Rogue's dark brews and the pub experience. It would be nice to have a place like this close to home. There are 35+ reviews on this page and Rogue takes my vote for the best. This shouldn't be taken as a slight to the rest; Rogue is just that good. Did i say I have never had a bad Rogue? Website: Rogue.com Photo album on the GBL FB page. Public Coast Brewing Co.- Cannon Beach, OR. Seaside Brewing Co. - Seaside, OR. Three Magnets Brewing Co. - Olympia, WA. Pour Taproom - St. Petersburg, FL. St Pete Brewing - St. Petersburg, FL. Right Around the Corner Brewing Co. - St Petersburg, FL.. This was really a 'walk by tasting' as we had a beer and headed on. RATC is Florida's first arcade brewery; with many classic arcade games all around. Think Nintendo, Pac-Man and pinball games from that era. They only had three of their own brews but also had other good brews available. I got the Blow my Cartridge IPA which was good but not memorable. We stepped out on the back patio met a local guy and noticed the Dog Bar down the street. RATC is dog friendly as are many St Pete places. The Dog Bar goes to another level. We will return another time. Cage Brewing - St. Petersburg, FL. A few blocks away, (right around the corner!) was Cage Brewing. Another dog friendly brewery that had some good brews and plenty of things to do. It was after dark so we couldn't really see the outdoor area which has tables and a large grassy area for the dogs. Our sampler flight had several IPAs and Peppermint Patsy, a mint chocolate chip stout. The King Krush Double IPA was my favorite. Krush was tasty and very hoppy; I like a double that is lower in ABV, 7.9% here. I don't really need it much stronger to enjoy the more robust flavors of a DIPA. The beer selection had a wide variety of styles, with 20 total. Growlers to go are available as well as wine. Foosball and other board games, (Fact or Crap and more) provide different things to do while quaffing good local beers. Cage is a good local brewery with something for everyone from good brews to a night out with bands playing regularly. See their FB page for more event information. Pinellas Ale Works- St. Petersburg, FL. After a fun afternoon of brews and blues at 3 Daughters Brewing we discovered Pinellas Ale Works. PAW is another dog friendly brewery with a closed in patio so the dogs can run free. PAW has an extensive beer list with many styles. I appreciate this as some places have 6 to 10 and St Pete breweries all seem to have about twice that. This is good; the 'competition' between breweries is friendly and good for us beer drinkers. There will be better quality and more selection when there are so many choices. (St Pete alone has 17 on the local 'ale trail' and the entire Tampa Bay area has well over 50.) By contrast Dade county (Miami) has fewer than 20 for a larger population. PAW is set up for you to order beer and take it to where you want to sit. There is a small bar, nice high tables and the above mentioned patio. We chose the patio where well behaved dogs were having a good time along with their owners. The dog theme continues with many of the beer names. Our flight had Puppy Love, Off the Leash, Thrill Hill and Peppermint Stout. Puppy Love was an NE IPA and Off the Leash was an American IPA. Thrill Hill was a double IPA and the best for me. We enjoyed our time here and so did Tito, Mitzie's Chihuahua dog. He had fun meeting all the bigger dogs and will return again. Overall a good visit, I would like to try some the other brews; there is a decent deletion of dark brews for you dark beer fans. The up to date tap list is on their website: PawBeer.com The photo album St Pete brewery sampler can be viewed on the GBL FB page. Local is great if it is a great local!